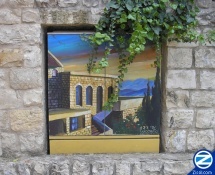 Young Tzfat artist specializing in religious-themed paintings. Gadi Dadon has been living and working in Tzfat since 2002. Many visitors are entranced by his depictions of Biblical and Jewish-themed scenes. Gadi grew up in an Ultra-Orthodox family which had immigrated from Morocco and settled in B’nai Brak. He wanted to study art and was accepted into the WIZO (World International Zionist Organization) Tzarfat (French) school while still in high school but his impoverished family could not afford the school fees. After he left school Gadi traveled throughout the world and supported himself by painting sidewalk murals. His religious observance dropped during these travels but he returned to his roots and moved to Tzfat in 2002. His paintings began to include religious and biblical themes. Gadi’s oils on canvas have Tzfat, Biblical, Jewish and religious themes. He uses bright colors and dynamic poses to convey the joy of Jewish tradition and belief. Some of his better-known works include the Parting of the Red Sea, “Kever Rachel” (Rachel’s Burial Plot), the “Beit HaMikdash” (Holy Temple of Jerusalem), the Blessing over the Wine and Street Scenes of Safed. He also paints Jerusalem scenes and portraits of religious figures. Gadi was invited to exhibit his artwork at the Moshe Dadon permanent exhibition at the Dadon Gallery on Yosef Caro Street in Safed’s Old Jewish Quarter. Gadi’s vibrant oil renditions of Jewish life and the Tzfat landscape compliment his uncle Moshe Dadon’s microcalligraphy and the work of the other artists who exhibit at the gallery. Gadi is available daily to present and discuss his work and inspirations.